Potentially Significant, Strong, & Violent Tornadoes (EF2+) Possible! Tornado Outbreak Likely! 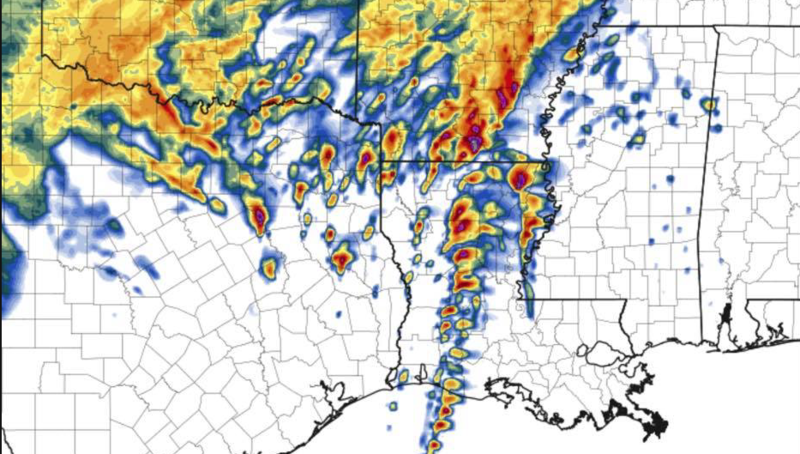 — some may be potentially significant, strong to violent (EF2+) — Tornadoes are possible today from east Texas to central Mississippi. 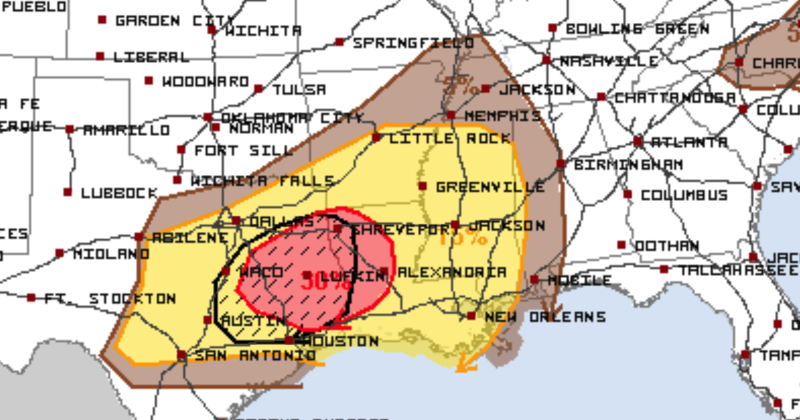 Otherwise, numerous severe thunderstorms will pose a risk of large hail, damaging wind and tornadoes from central Texas this morning to the Tennessee Valley region overnight. .In mid/upper levels, a leading/northern-stream perturbation will eject northeastward across from its present position over Lake Superior and northern Ontario, across Quebec. To the southwest, a deep, high-amplitude trough is evident in moisture channel imagery over NM, far west TX, and northern MX. This trough will pivot east-northeastward today, developing a closed 500-mb low by 00Z near the DFW Metroplex, and extending southwestward across Coahuila. By 12Z, that low should reach eastern MO, with trough southwestward over the Arklatex to deep south TX. At the surface, the 11Z analysis showed the primary surface low along a band of convection south of SJT. A double structure was apparent to baroclinic zones to its east: the first a quasistationary front across central TX to near a SHV-CBM-CHA axis. The southern front was quasistationary just south of UVA and SAT, becoming a warm front over southeast TX and south-central LA, then quasistationary again over coastal AL and coastal western FL Panhandle. The primary surface low should deepen and cross the Arklatex region late this afternoon into early evening, reaching the lower Ohio Valley around EVV by 12Z. The southern is expected to accelerate northward from mid/late morning, to and perhaps past the I-20 corridor in northeast TX and LA, then over Mississippi, likely merging with the northern one. By that time, a cold front should extend from the low south-southwestward across the MS Coast area, likely preceded by an organized quasi-linear MCS over the Deep South. 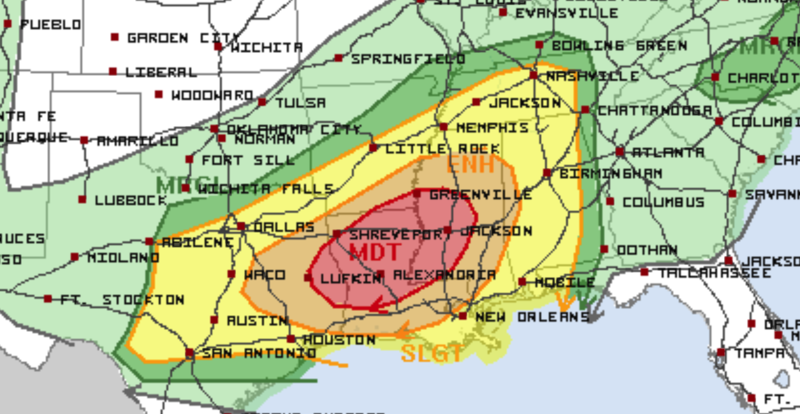 A regional outbreak of severe thunderstorms, with the main concern being damaging tornadoes, still appears possible today in and near the categorical moderate-risk area. Only peripheral adjustments were needed for this outlook package, based on convective trends this morning and (on the eastern edge) continuity of overnight severe potential into the early day-2 period. Strong-severe thunderstorms are ongoing across portions of the Hill Country southward toward the Rio Grande. This convection will pose a severe threat into central TX through the rest of the morning. Refer to SPC watches 48-49 and associated mesoscale discussions for near-term details. East of the ongoing activity, the parameter space will become very supportive of supercell/tornado potential through the day in the warm sector, with the main uncertainties being longevity and discreteness of favorable storm mode. As the southern front moves farther inland, a deeply moist boundary layer will spread across the region, with surface dew points commonly in the mid/upper 60s F and locally near 70, PW 1.5-1.75 inches, and mean mixing ratios increasing to 15-16 g/kg, with forecast soundings showing favorably low LCL. Gradual diabatic heating in pockets will weaken already meager MLCINH from midmorning onward, enabling storm formation on pre-MCS sources for weak lift such as confluence/convergence lines, and perhaps persistent/relatively deep horizontal convective rolls. Lapse rates will strengthen with westward extent, supporting preconvective MLCAPE ranging from 2000-3000 J/kg over parts of east TX to 1000-2000 J/kg over portions of LA and MS. Such buoyancy will be more than favorable for all forms of severe, amidst strengthening deep shear related to the approach of the mid/upper trough. Furthermore, low-level shear vectors and hodograph sizes will be quite large along and south of the warm front, with forecast soundings yielding 250-600 J/kg effective SRH. 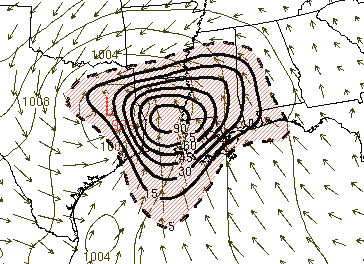 Any sustained supercells in this environment will be capable of significant tornadoes. With time this evening and overnight, convection should organize into a roughly north/south-aligned band over the lower Mississippi Valley region, as deep convergence becomes better-focused in the mass response ahead of the synoptic wave. As this occurs, the main threat in a bulk sense may become damaging wind tonight. However, given the strong inflow-layer SRH, tornadoes still will be probable from both embedded supercells and QLCS mesovortices. 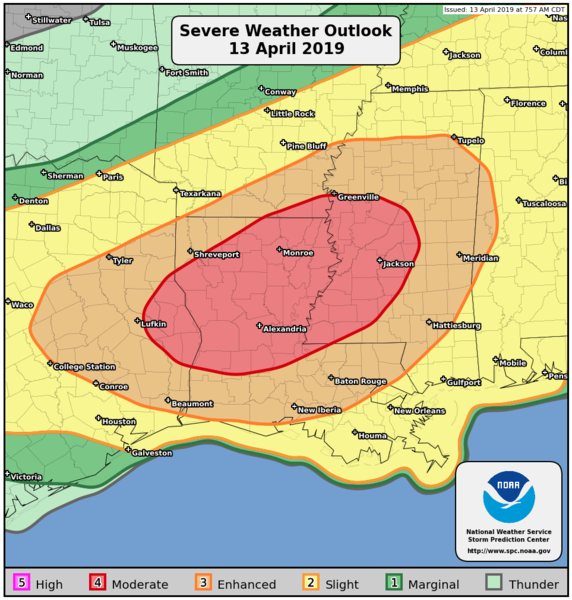 Widely scattered to scattered thunderstorms are expected to develop through this afternoon, offering the potential for damaging gusts — perhaps reaching severe limits on an isolated basis — and isolated severe hail. Mid/upper-level support will be lacking, beneath a belt of southwesterlies aloft. However, diabatic surface heating amidst weak ambient MLCINH should enable only weak lift necessary to initiate convection. The area will straddle a low-level moist axis characterized by surface dew points generally in the mid/upper 60s F, supporting peak preconvective MLCAPE in the 1500-2000 J/kg range. Though low-level flow will be weak, limiting boundary-layer shear and hodograph size, the height gradient will remain sufficiently tight aloft to support strong storm-relative/ventilating winds in upper levels, and effective-shear magnitudes around 40-50 kt. As such, a few organized multicells and sporadic supercell structures will be possible. Convective potential will be strongly tied to the diurnal cycle, and should wane precipitously after 00Z. Now is the time to be prepared!